Habit: Plant 1--10(15) dm; +- self-incompatible. Stem: distally generally sparsely to densely stalked-glandular (nonglandular); main axis obvious. Leaf: green or gray-green, all or distal stalked-glandular, glands yellow or golden. Inflorescence: heads in panicle-like clusters; calyx-like bracts subtending involucre 3--5; involucre obconic; phyllaries 5--7 mm, on angles minutely coarsely hairy to coarsely long-straight-hairy, hairs +- widely spreading or curved toward phyllary tip, 0.3--1+ mm. Ray Flower: ray 7--13 mm. Fruit: glossy, not striate. Chromosomes: 2n=14. Citation for this treatment: Bruce G. Baldwin 2014, Lagophylla glandulosa, in Jepson Flora Project (eds.) 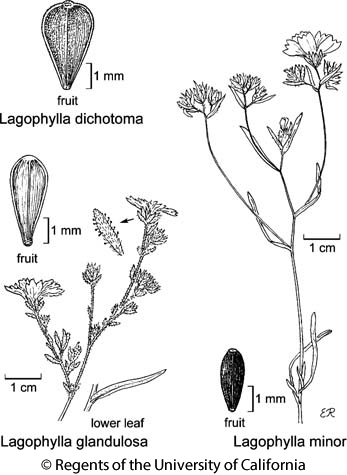 Jepson eFlora, Revision 2, http://ucjeps.berkeley.edu/eflora/eflora_display.php?tid=3717, accessed on April 23, 2019.
c NCoRO (e edge), c NCoRI, CaRF, SNF (rare s), n GV. Markers link to CCH specimen records. Yellow markers indicate records that may provide evidence for eFlora range revision or may have georeferencing or identification issues. Purple markers indicate specimens collected from a garden, greenhouse, or other non-wild location.